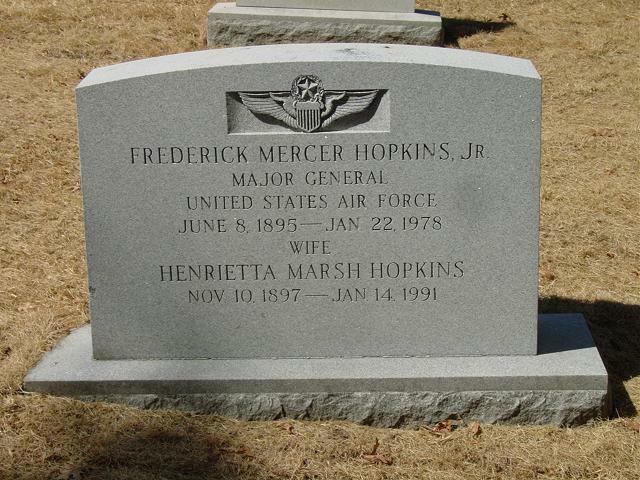 MAJOR GENERAL FREDERICK M. HOPKINS JR.
Frederick M. Hopkins Jr., was born in New York City in 1895. He graduated from high school in Yonkers, New York, and attended Columbia University in New York City before entering the New York National Guard as a Private July 15, 1917. He served with the Coast Artillery of the New York National Guard at Fort Schuyler, New York, until April 1918, when he was transferred to Fort Monroe, Virginia. He was commissioned a Second Lieutenant in the Coast Artillery Reserve June 16, 1918, and in August went to Langley Field, Virginia, to attend the School of Aerial Observation. The following month he was assigned to Taliaferro Field, Texas, for duty at the school of Aerial Gunnery, and remained on the intelligence staff at that station. In November 1918, he went to Mitchel Field, New York, and the following May was transferred to Pope Field, North Carolina. He went to Europe in September 1920, for duty with the American Forces in Germany at Coblenz and at the Weissenthurm Airborne. Returning to the United States in June 1922, he was assigned to Pope Field, North Carolina. He began flying training at the Air Service Flying School at Brooks Field, Texas, in September 1922, and the following May entered the Air Service Advanced Flying School at Kelly Field, Texas. Upon graduation in September 1923, he was made director of observation training at that field. Two years later he entered New York University, from which he received his bachelor of science degree in mechanical engineering in June 1926. He then became engineering officer of the First Observation Squadron at Mitchel Field, New York. In September 1926, he returned to New York University as a professor of military science and tactics. In August 1930, he became adjutant of Fairfield Air Depot in Ohio. The following July he entered the Air Corps Engineering School at Wright Field, Ohio, and, upon graduation in June 1932, became assistant commandant of the school. He entered the Air Corps Tactical School at Maxwell Field, Alabama, in August 1936, and graduated in June 1937. The following month he entered the Command and General Staff School at Fort Leavenworth, Kan., from which he graduated in June 1938. He then became an instructor at the Air Corps Tactical School at Maxwell Field. In July 1940, he went to Washington, D.C., as assistant executive officer of the Materiel Division in the office, chief of Air Corps. He became chief of the Facilities Section in that office in November 1940. In March 1942, he was transferred to Air Force headquarters in Washington as chief of the Resources Division in the office of the assistant chief of air staff for Maintenance, Materiel and Distribution. He was designated redistribution and salvage officer at Air Force headquarters in July 1943 and in August 1944 assumed additional duty as War Department representative on the Facilities Committee of the War Production Board. In May 1945, he became chief of the Resources Division in the Office of the Assistant Chief of Air Staff for Materiel and Services at Air Force headquarters. In August 1945, he went overseas for duty with the U.S. Strategic Air Forces and on Aug. 26 became commanding general of the Seventh Fighter Command of the 20th Air Force. In February 1946, he was appointed chief of staff of the 20th Air Force, and on March 19 was named commanding general of the 20th. In November 1946, he became commanding general of the Pacific Air Service Command, which was redesignated the Far East Air Materiel Command in January 1947. In August of that year he was assigned to Air Materiel Command headquarters at Wright-Patterson Air Force Base, Ohio, and in November was appointed chief of the Industrial Mobilization Division at Air Materiel Command headquarters. He became deputy to the commanding general for operations of Air Materiel Command in September 1949. General Hopkins is rated a command pilot, combat observer and aircraft observer. He has been awarded the Distinguished Service Medal and the Legion of Merit.